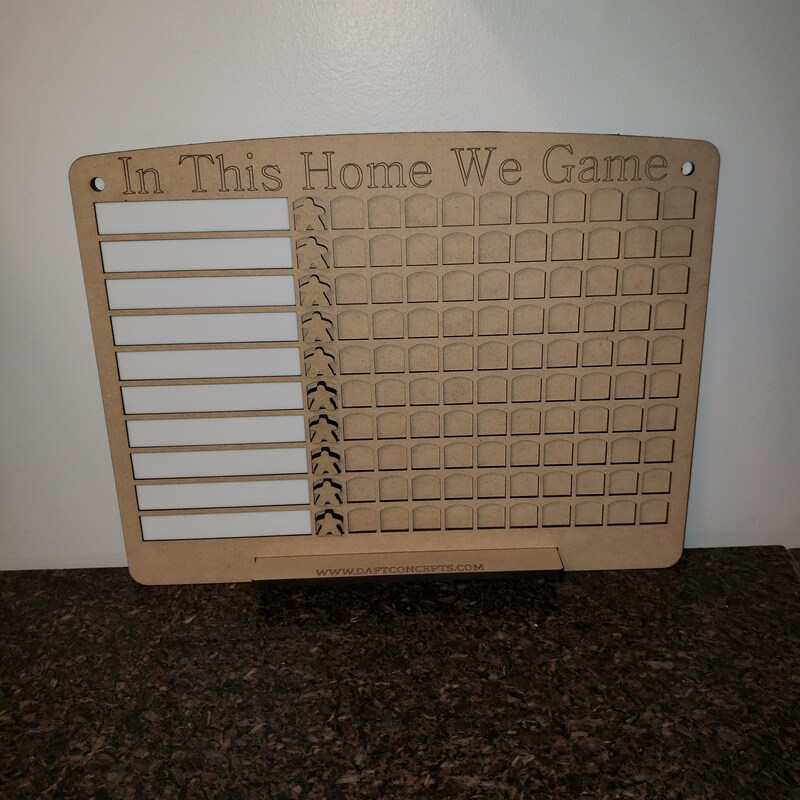 This plaque is intended for you to use in tracking your game plays to complete a 10 x 10 Board Game Challenge. The idea is to list ten different board games you want to play at least ten times through out the year. Each time you play one of the games, you advance the little meeple token one space on the game tracker. Get all ten meeples to the last space and you have completed the challenge. The first spot on the track is the zero spot for you to leave the meeple until the first game is played. 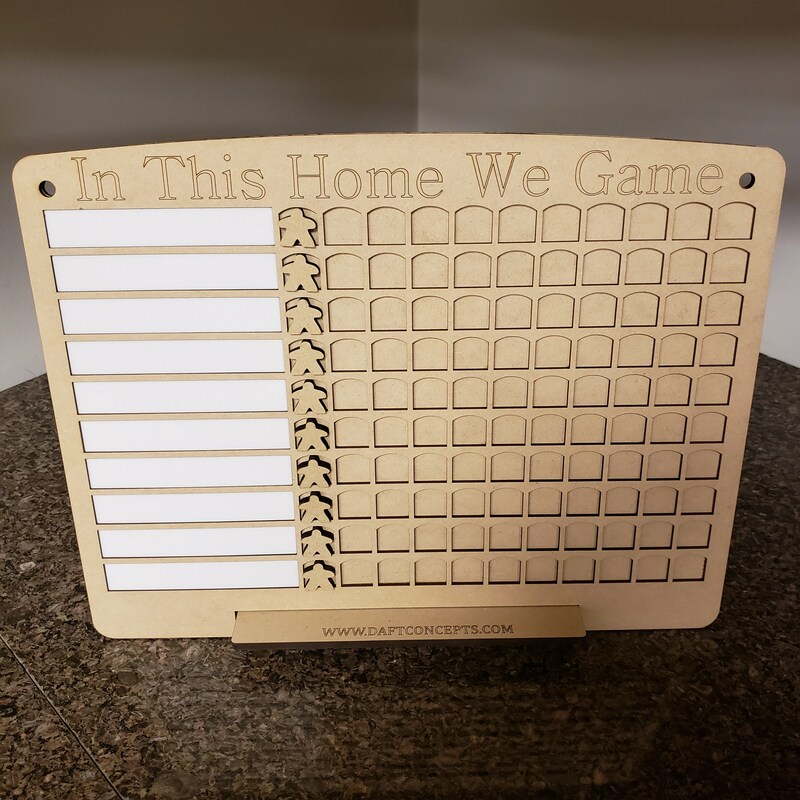 The plaque itself is 15 1/8" wide x 11 5/8" tall x 1/4" thick. It is made out of MDF. 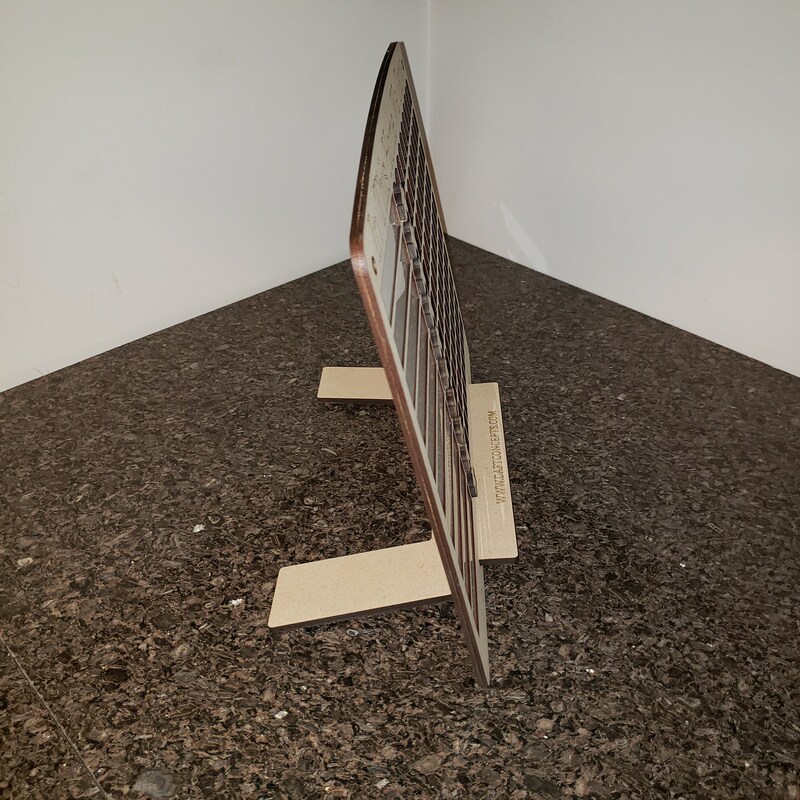 It comes with two different styles of feet, one large base for standing it up on a surface such as a table and one smaller base for use to hang it on the wall. You need to use the smaller base to keep the tracker at an angle. 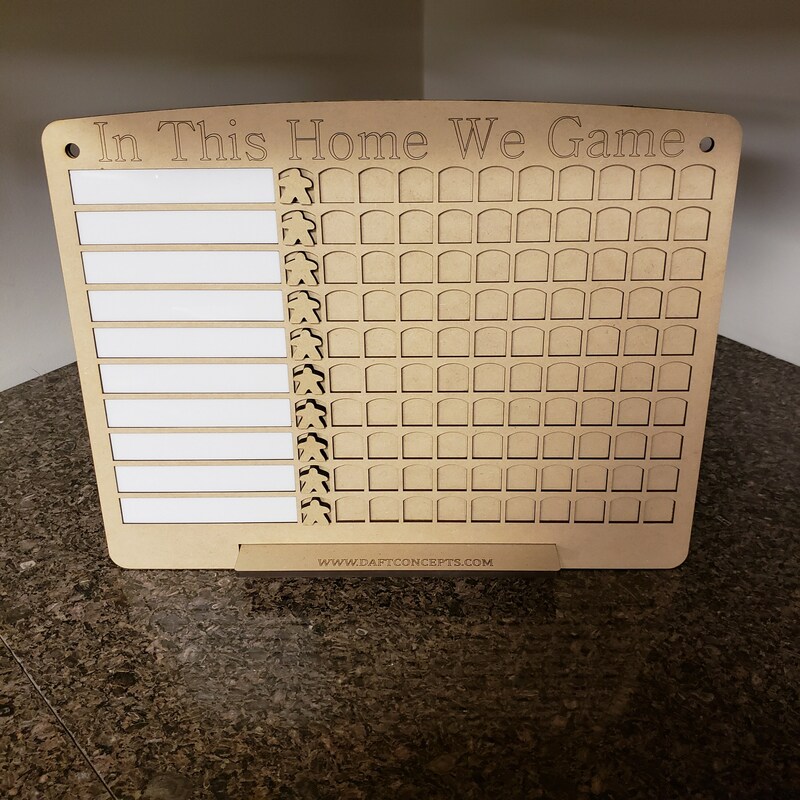 It comes with 10 white dry erase marker boards to list the names of the games you want to play. It comes with 10 1/4" thick meeples. 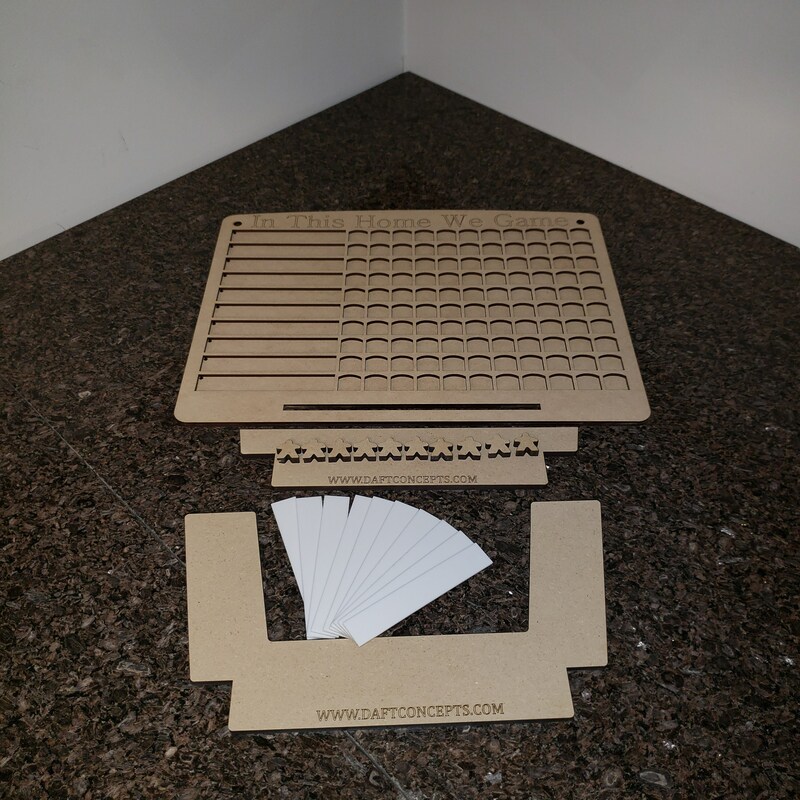 The set comes sanded, assembled, but unfinished for you to paint or stain as you see fit. You can customize the text at the top of the tracker by leaving us a note in your order of what you would like it to say. If no note is left at time of purchase, the standard text will be applied. 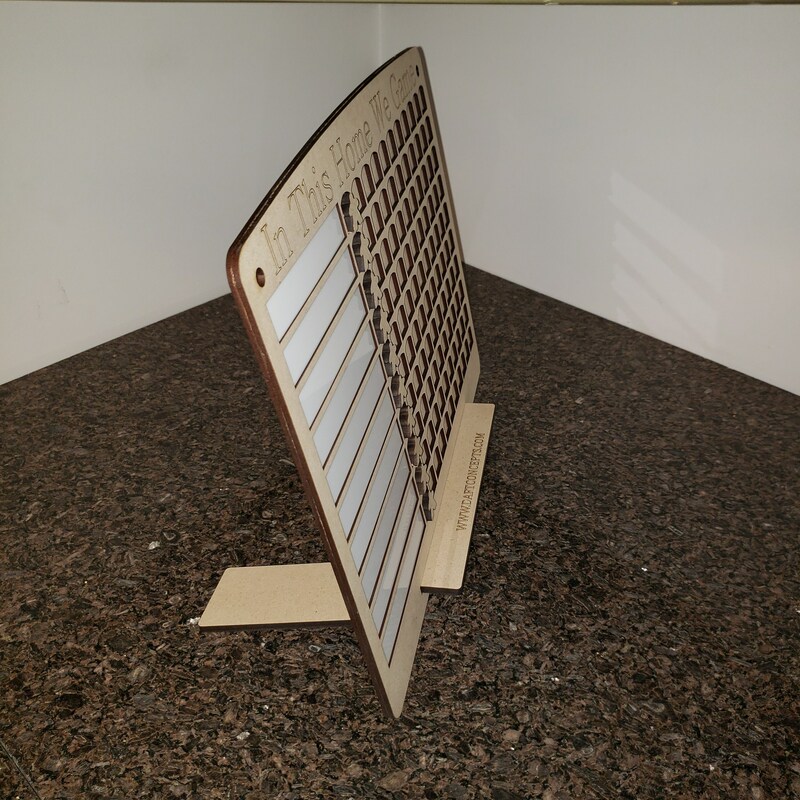 If you are in the Salt Lake, Utah area and would like to pick up your item in person, send me a note and I will let you know when the item is ready for pickup. Shipping is free in the USA. Email us for shipping prices outside of the USA. Items are shipped via USPS. If you would like a package sent signature required, please let me know so that I can determine what the extra cost will be. I will then contact you with a way to take care of the extra cost. In the case of international orders, you may be required to pay additional fees and taxes (VAT) by the postal service when you pick up your package. We are not responsible for those and have no way of knowing what they will be, if they are charged. In the case of loss or damaged items, those items will be replaced if lost of damaged by the post office. If you prefer to exchange for an item of equal or lesser value please contact me. No refunds will be given for the look of any wood item as I can't control the grain or any blemishes that might come on the sheets of material I use.